A poem in fragments, depicting memories of China's Cultural Revolution. From Russia, this contemporary story describes a sculptor's attempt to create a life that matches the perfection of his art. From China, the story of an attempt to understand a long-ago life and death. Greek Stoic philosopher who taught that the key to wisdom is knowing what one can and cannot control. According to Epictetus, humans only have full control over our own minds. We don't have control over our bodies, our possessions, or our reputations, and trying to control those elements will only lead to a "slavery of the soul." Published in Words Without Borders' November 2008 Issue: Immigration. Peter Golub is a Moscow-born poet and translator. He has published original work and translations in various journals, including ARC Poetry, Cimarron, and World Literature Today. In 2008 he edited an anthology of contemporary Russian poetry, which was published by Jacket Magazine. In 2007 a bilingual edition of his poems, My Imagined Funeral, was published by Argo-Risk Press in Moscow. He is currently a translation consultant for the St. Petersburg Review, and is pursuing his PhD at Columbia University. He is the recipient of a PEN Translation Grant for a collection of flash fiction by Linor Goralik and a BILTC Fellowship for the poems of Andrei Sen-Senkov (Zephyr Press). Find out how Danila Davydov first began writing poems, and how he was saved from "psychological damage," in translator Peter Golub's: "'There are at Least 2000 Good Poets:' An Interview With Danila Davydov". Then, find out about the unusually-named neighborhood where Peter Golub grew up, and why he prefers to call translation "transcription," in this WWB interview: A Kind Of New Alchemy: An Interview With Translator Peter Golub. Altercatio Adriani Aug et Epicteti philosophi (Conversation between Hadrian Augustus and Epictetus the philosopher), by Christoffel Schweytzer, 1552.
of the article is particularly relevant to the poem. See how children respond to puppets in these photographs from Time magazine and Moscow's Museum of the Puppet Theater (below). 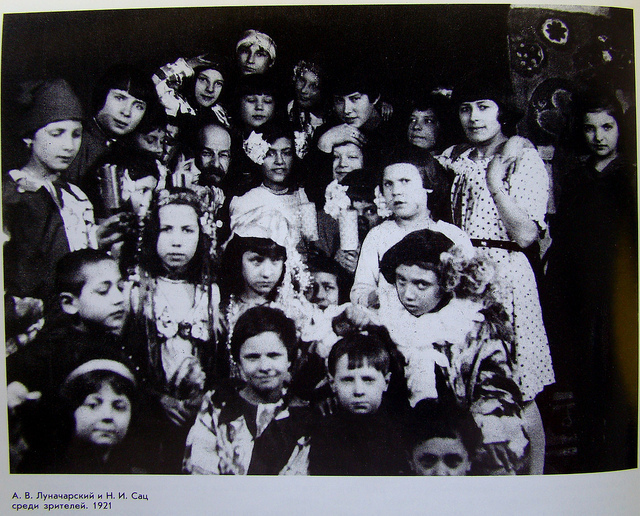 Children at puppet show, Russia, 1921. Catalog of The Museum of Puppet Theater, Moscow. Posted by Elizabeth. Then, view more interactions, including those between puppets and penguins, in this gallery of a photography magazine's puppet-themed competition. Read more poems from Davydov, also translated by Golub, and published in the magazine Jacket 36. Then, watch him read the third poem, "[The kids caught a demon]", in Russian. … And read Peter Golub's introduction to the issue of Jacket 36: "The Young Post-Soviet Poets." For a different genre from Davydov, read his story “The Telescope,” which Alexander Hemon calls "a masterpiece," in Best European Fiction 2012. Finally, if you know Russian, browse Davydov's far-ranging website litkarta.ru., "A literary map of Russia." "I was thinking…" by Elena Shvarts, which, like this poem, is about the relationship between a creator and a creation. 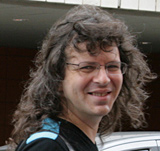 Sergey Gandelevsky's poems "Elegy" and "Stanzas"
The poet Dmitry Kuzmin, whom Davydov calls his "great collaborator," also has work on WWB Campus. Read his essay "On the Moscow Metro and Being Gay." Then, find out what it means for Davydov to be part of the "Vavilon generation" in this conversation between Peter Golub and Dmitry Kuzmin: "Inventing Vavilon." Read "Soul, You Are a Street," another Peter Golub translation of a contemporary Russian poem on WWB Campus. Then, read other translations of Golub's, published in Words without Borders. Then, visit Peter Golub's witty blog, "The Foundation Pit." The title comes from a novel by Andrei Platonov, whose work also appears on WWB Campus. 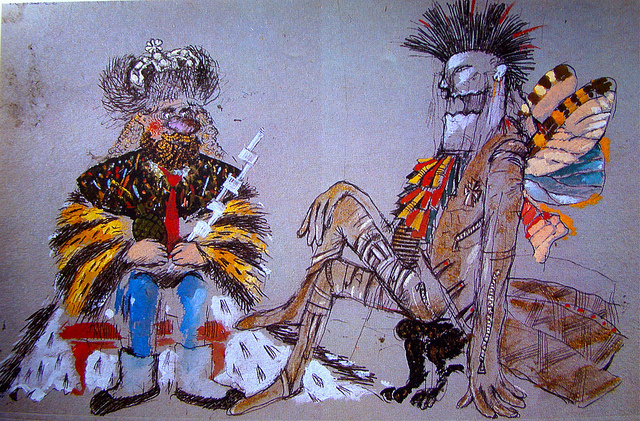 Character sketch for puppet show from The Museum of Puppet Theater, Moscow. Posted to FlickR by Elizabeth. Puppets hold a special place in Russian culture. First, learn about two famous puppet-themed works that capture some of the same "fin de siècle...eeriness" we find in Davydov's poem. 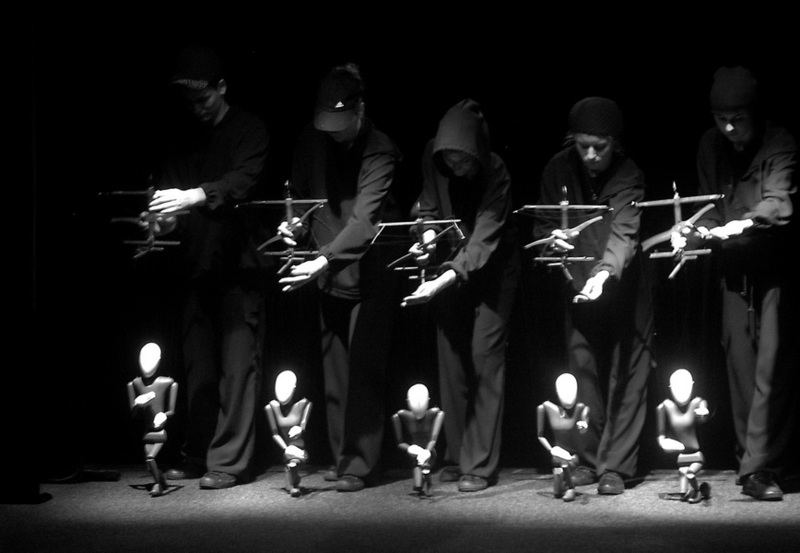 Then, look through a gallery of images of contemporary Russian puppetry, originally published on a state-run website; and read about the puppet show that so enraged Russia's current leader that he took over its broadcast network. Finally, read about the new connotations of the word "puppet" in Putin's Russia. From Mexico, "The Gringo Champion," a story that juxtaposes scenes from a young migrant worker's present and past. "Techniques of Fragmentation Used in Modernism," a blog post on literariness.org. William Faulkner's novel The Sound and the Fury (recommended in blog post above). Advertisement in Moving Picture World for the American film A Doll's House (1917). The Hole song, "Doll Parts".